A few years ago I visited NUI Galway to address the students on the peace process. The hall was packed and for reasons I still don’t quite understand there were very few chairs put out for the hundreds of students who turned up. Most sat on the floor and the craic was great. I was back there again on Tuesday. The heir to the British throne, Prince Charles, was in Ireland with his wife Camilla for a four day visit. At the weekend the Sinn Fein Ard Chomhairle met and discussed the party’s approach. On her recent visits to Ireland the British Queen Elizabeth had made clear her desire to be part of a process of reconciliation and healing. The meeting between Martin McGuinness and Queen Elizabeth in Belfast and then subsequently during a state visit by President Michael D, were widely acknowledged as historic and a boost to reconciliation efforts. 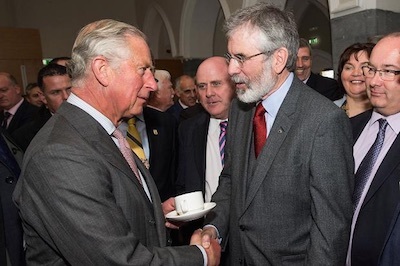 It was in this context, of peace building, that I raised the possibility of Sinn Fein leaders meeting with Charles during his visit. I believed that such a meeting could be very helpful as we seek to heal the hurt of decades of conflict. Following several conversations it was agreed. On Tuesday morning Senator Trevor O Clochartaigh and I arrived at NUI Galway. We were to be joined later by Martin McGuinness for a private meeting when the formal NUIG business was over. By the time Trevor and I arrived most of the guests were already assembled. They included school children from Connemara. At Trevor’s prompting they gave us a rousing rendition of Peigin Ligir Moir. I was delighted especially to meet Colm Seoighe a wonderful young guitarist and his fellow students and singers and their teachers. Colm’s guitar is autographed by Christy Moore. ‘Ride On’ duirt me leis. In the meantime it rained. Then the sun shone warmly. Then it rained again. Luckily the meeting with Charles was indoors. We were introduced at the reception by Gearoid O Conluain on behalf of NUIG and shook hands. “Welcome. It’s good that you are back and going to Mullach Mor”. We spoke briefly before I introduced him to Trevor. Later Trevor joined Martin and me for a private meeting with Charles. This engagement lasted about 20 minutes or so upstairs in an office. It was a cordial and relaxed discussion. Despite some of the difficult issues we each spoke of it was a positive conversation. We acknowledged that he and his family had been hurt and suffered great loss at Mullaghmore by the actions of Irish republicans. Martin and I said we were very conscious of this and of the sad loss of the Maxwell family whose son Paul was also killed. We spoke also of the hurt inflicted on our friends and neighbours and on our own communities in Derry and Ballymurphy and Springhill by the actions of the Parachute Regiment and other British regiments. In 1971 and 1972 in Ballymurphy and Springhill sixteen local citizens, including three children, a mother of eight, two Catholic priests and ten unarmed men were killed by the Paras. I also told him of the campaign by victims of the Dublin and Monaghan bombings to get the British Government to hand over its files about these events - believed to involve its agents - to Irish authorities. He shared his own memories of the conflict starting in the 60s. It is obvious that he wants to play a positive role in making conflict a thing of the past. That is the Sinn Fein view also. Thankfully the conflict is now over. Tuesday’s meeting is part of the necessary process which must now address in a more substantial way than ever before the issue of reconciliation and healing. That must mean that all victims and survivors of the conflict, who are still seeking justice and truth are given the strongest support. Whether they were bereaved by the IRA, or by the myriad British state agencies, or through state sponsored collusion, the victims and their families and communities deserve justice. In this context it is crucial that the process of healing and of reconciliation is enhanced and strengthened. Tuesday’s meeting in itself is a significant symbolic and practical step forward in the process of healing and reconciliation. But for substantial progress to be made the Governments and the political parties will have to build on this opportunity. Reconciliation is an enormous challenge for all of us. It is a personal process of dialogue, engagement, and compromise. It’s about healing the past and building a new, better and fairer future based on equality. There is now a peaceful way to end partition and the union. All who want a United Ireland have a duty to embrace this and to make friends with our neighbours. The participation of myself and Deputy First Minister Martin McGuinness and Seanadoir Trevor O Clochartaigh and other Sinn Fein leaders in the visit by Prince Charles is a measure of our commitment to resolving outstanding legacy issues and to be part of an inclusive healing and reconciliation process and a new political dispensation between the people of this island. I have no doubt that some people will be upset at the Galway meeting. That is their right if they are victims or survivors. Others may be upset because of their politics or because they have a narrow view of the past and no real strategy for the future. That also is their right. But our resolve and responsibility is to ensure that no else suffers as a result of conflict; that no other family is bereaved; that the experience of war and of loss and injury is never repeated.This means all of us working together. That requires generosity and respect from all and for all. There are many challenges facing the political Institutions established by the Good Friday Agreement and by the popular will of the people of the island of Ireland. These challenges, which are multiple and immediate, must be overcome. Leaders have a responsibility to lead. That is what we are trying to do. As we face into the future let all our steps be forward steps.